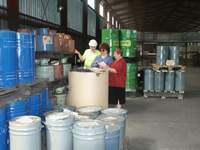 Thirty years ago Materials and Technical supply Department became a separate department. It moved from Yakutsk to Nerungri . From the very beginning many qualified specialists worked in the department. Specialists of UMTS took active part in the construction of "Nerungrinsky" mine and of coal-washing plant, the largest in Europe. Today, when "Yakutugol" became open joint stock holding company, UMTS is, as before, one of the most important affiliates of the holding company with its professional staff , people who arrange process of supply at the very high professional level. Material a and technical supply Base (BMTS) is one of the structural divisions of UMTS, it is responsible for reception of cargoes , their handling, storage and issuance of material assets to affiliates of "Yakutugol" and to other enterprises. The area of BMTS is 13 Hectares. In this area there is a complex for reception, storage and issuance of material assets. i.e. three rail road lines for railroad cars delivery for unloading; handling complex including loading machineries such as cranes, forklifts; and warehouses. Warehouses are for storage of material assets , they are outdoor and indoor warehouses. Total area of the warehouses is 14118 sq.m. Cargo handling volume in 2004 was 33000 tons. 195 railroad cars were unloaded , 472 cargo containers were handled. Base for oil products supply is the structural division of UMTS, affiliate of OJSHC "Yakutugol" . The main sphere of activity of oil tank farm is provision of affiliates of the holding company with lubricants. Assortment of the products to be handled are as follows: diesel fuel, petrol, more than 40 types of oil and lubricants. UMTS affiliate render services to the concerned enterprises and organizations for handling, storage of different equipment, materials and lubricants.